Americans brought more than just unwanted gifts to the mall on Monday. They carried anger. A series of apparently unconnected fights and disturbances broke out at malls across the country on the day after Christmas — known as "Boxing Day" in many British Commonwealth countries, for reasons unrelated to fisticuffs — leaving shoppers desperate for an exit and authorities struggling to wrangle unruly crowds. Several arrests and multiple injuries were reported — including an assault on an officer — and authorities and witnesses described panic-stricken scenes from Aurora, Colo. to East Garden City, N.Y. In Manchester, Conn., police said what began as an unspecified "disturbance" among 10 teenagers on Monday afternoon quickly escalated as multiple fights broke out simultaneously, NBC Connecticut reported. A video posted to Facebook shows a mass of people at the Shoppes at Buckland Hills throwing wild punches, then fleeing with authorities and a large crowd giving chase. "Never go to the mall right after Christmas," the accompanying post says. A police officer was assaulted while trying to break up the fight, NBC Connecticut reported, and several people were arrested, though they had not been identified. In Colorado, the Town Center at Aurora was shuttered and evacuated on Monday afternoon after the Aurora Police Department reported "multiple skirmishes" and "a large disturbance" inside the mall. Video obtained by NBC affiliate KUSA shows a crowd gathered outside the mall and several police officers trying to control it. Two people who appeared to be handcuffed can be seen lying on the ground. Someone can be heard saying "she is dragging her by her hair," though it's unclear who is being referred to. Moments later, someone else screams: "I can't breathe." The department said in a Twitter post that no officers or customers were injured. In Beachwood, Ohio, a mall outside Cleveland was closed after a fight on Monday night led responding police officers to pepper spray a large crowd, Cleveland.com reported. "My whole body burned," a witness, 19-year-old John Boyd, told the site. In Chattanooga, Tenn., and Elizabeth, N.J., there were reports of gunshots on Monday afternoon. At Hamilton Place, in Tennessee, that gunfire turned out to be a cover-up attempt, NBC affiliate WRCB reported: teenagers threw firecrackers to divert attention from a shoplifting incident. The teens were still at large, though they were seen on surveillance footage, a police spokesman told the station. Several customers were injured in the crush of people trying to flee the mall. © Jim Weber/The Commercial Appeal via AP Police officers continue to patrol the area as people linger in the parking lots around Oak Court Mall after the mall was closed due to a disturbance Monday, Dec. 26, 2016, in Memphis, Tenn. Massive brawls and food-court fights played out at more than a dozen malls across the country in what proved to be a chaotic day after Christmas. Some of the mayhem was captured on social media. The chaos prevented some shoppers from grabbing clothes off clearance racks and returning gifts. The mall incidents, which ranged from minor melees to mass evacuations, occurred from Colorado to Tennessee and Texas to New Jersey. Police in some cities are investigating the role social media may have played in organizing the disturbances. The motive behind the mall brawls is not yet known. Here's what happened at nine of those malls. Aurora Police Department spokesman Sgt. Chris Amsler said about 100 people had gathered in the food court before the brawls broke out -- prompting the Colorado mall to close early on Monday afternoon..
As police officers on duty arrived, fights broke out throughout the mall, at a movie theater and at a nearby park-and-ride lot, he said. In Aurora, Illinois, eight juveniles, ranging in age from 13 to 17, have been charged in connection with the large disturbances at Fox Valley Mall, police said in a statement released Tuesday. 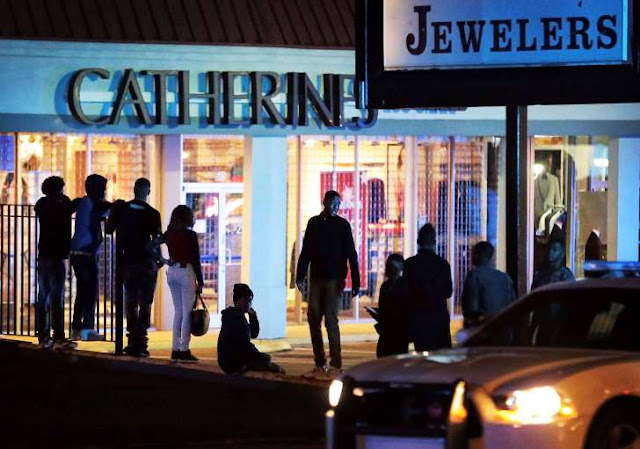 The teens were taking into custody Monday evening after police received a call for assistance at the shopping center"due to an unruly crowd in the common area," police said. "All of the charges lodged are misdemeanors, however, police are not ruling out enhancing them to felonies," the statement said. More arrests are possible, police said. Moments after the call, a fight broke out in the food court area and those were followed by several other smaller altercations, the Aurora police said. The brawl forced evacuations and the mall closed. No injuries were reported in the incident. In Memphis, seven people were arrested after incidents at two malls, CNN affiliate WMCA reported. Loud sounds kicked off a wave of panic at Hamilton Place Mall, in Chattanooga, Tennessee. Several people were pushed to the ground as shoppers rushed to exit the mall, police said. Officers rushed to the scene after receiving reports of "shots fired," but the sounds turned out to be fireworks. "Our investigation concluded that it was perpetrated a group of individuals who were setting off fireworks, possibly to coverup the actions of a shoplifting crime," the Chattanooga Police Department said in a statement. Minor injuries were reported after the incident. Police have descriptions of the suspects involved in this incident and video footage, the statement said. In Fayetteville, North Carolina, people panicked after teenagers fought in the food court, Fayetteville police spokesman Shawn Strepay told CNN affiliate WRAL. No shots were fired, despite reports of gunfire, Strepay said. The first calls from the The Mills at Jersey Gardens came in just after nightfall Monday. Witnesses said they thought they had heard shots fired. That, along with a fight, led to what Elizabeth police Officer Greg Jones described as a "chaotic panic and everybody running all at once." Amateur video taken from inside Buckland Hills Mall, in Manchester, Connecticut, shows people screaming as punches were being thrown inside the shops on the day after Christmas. "It was estimated that there were several hundred teenagers inside the mall and several other fights broke out around the same time," the Manchester Police Department said in a statement. No weapons were involved, but one Manchester police officer was assaulted while trying to break up a first fight, police said. The officer did not sustain any significant injuries. There were no reported injures or property damage -- thanks in large part to local police, Kelle said. Shortly after sunset, a large-scale disturbance broke out at Beachwood Place Mall, in Beachwood, Ohio. An initial report of gunfire was quickly found to be false by police. "One male juvenile was arrested for attempting to strike an officer that was dealing with another disorderly patron," Beachwood police said in a statement. Beachwood police, officers from nearby jurisdictions and mall security were able to disperse the juveniles and remove them from the mall, police said in a statement. Beachwood Police Capt. Gary Haba told CNN that pepper spray was used to disperse a large crowd at one point. The disturbance appears "to have been loosely organized on social media," the statement said. Beachwood mall was re-opened and there were no injuries or other arrests. Mall fights break out across U.S.
Police are investigating a string of fights in malls across the country during on of the busiest shopping days of the year. There were reports of fights in more than a dozen cities Monday, from Elizabeth, New Jersey, to Fort Worth, Texas. 0 Response to "Fights, Disturbances and Chaos Breaks Out Malls Across the United States"